Alzheimer’s disease is the most common cause of dementia. It is a complex disease that affects nerve cells in many parts of the brain, making effective treatment very challenging. Can stem cell research help us tackle this challenge in the future? Alzheimer’s disease (AD) is the leading cause of dementia. People affected by AD commonly experience memory loss, confusion and mood swings. The cause of AD is still unknown, but several theories focus on two proteins, called ‘amyloid beta’ and ‘tau’, which are found in deteriorating areas of an AD brain. Clumps of amyloid beta proteins form plaques that may prevent neurons from sending signals properly. Tau protein is important for normal cell function, but researchers think that when tau gets gnarled up into ‘tau tangles’ it prevents neurons from getting nutrition. There is currently no cure for AD. No stem cell treatments are currently approved for AD. Positive effects have been seen with neural stem cell transplants given to mice with a disease similar to AD, but researchers are still studying what these stem cells are doing and how they might help repair the brain. Researchers are using induced pluripotent stem cells to grow neurons that have the same genetic background as people affected by AD so they can study the disease. These neurons represent a tool to look for new drugs that can reduce amyloid and tau, and also find disease signposts that can help diagnose patients with AD earlier. There are many different neurons throughout the brain that are destroyed by AD, making each case unique and very difficult to treat. Successful stem cell treatments will need to distribute cells to damaged areas throughout the brain, make the correct types of neurons and other brain cells, correctly ‘wire’ new neurons into existing neuron networks, and, above all, be safe (e.g. not cause cancer or other complications). Some researchers argue that using new neurons made with stem cells to study Alzheimer’s disease will not accurately represent aged brain cells. Other researchers think this approach could be the best way to understand the earliest stages of AD. If stem cell treatments are eventually developed for AD, these treatments do not stop the cause of AD, meaning treatments may not last and people could suffer relapses. How is Alzheimer’s disease treated now? Can stem cells be used to treat Alzheimer’s disease? Alzheimer’s disease (AD) is the most common cause of dementia. The first signs of Alzheimer’s often include lapses in memory or struggling to find the right words. Over time, symptoms such as confusion, mood swings or memory loss develop and become increasingly severe. The cause of the disease is still unclear, but researchers have found that people affected by Alzheimer’s have an abnormal build-up of certain proteins in the brain. One of these proteins, called amyloid beta, clumps together to form ‘plaques’. Another, known as tau, gets twisted into protein ‘tangles’. Scientists are still exploring whether these plaques and tangles in the brain lead to the symptoms of Alzheimer’s or are a by-product of the disease. One theory is that plaques prevent nerve cells inside the brain from communicating properly. Tangles may make it difficult for the cells to get the nutrients they need. Whatever the exact processes involved, it is clear that as Alzheimer’s progresses, nerve cells, also called neurons, are lost. For this reason, Alzheimer’s is known as a neurodegenerative disease. Estimates suggest that up to around 1.5% of people aged 65-69 and around 25-30% of 90-year-olds have AD. Although the exact cause is not known, a number of risk factors have been linked to the disease. The biggest of these is aging. Women are more likely to be affected than men. Genetics (i.e. family history) plays an important role in AD. And more factors are constantly being determined, such as a link to obesity. There is currently no cure for AD. Drugs are available that can help with some of the symptoms temporarily, for example by improving memory or the ability to manage everyday tasks. Most of these drugs belong to a class called cholinesterase inhibitors (e.g. Aricept, Exelon, Reminyl). They can help prevent the breakdown of a natural substance in the brain called acetylcholine, which carries signals between neurons. 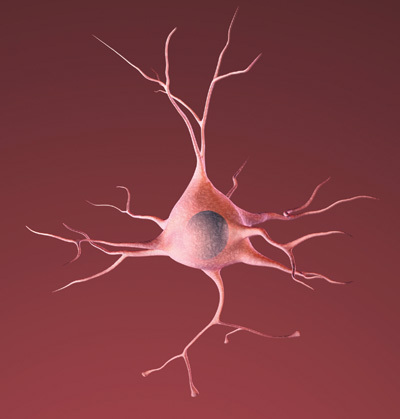 However, there are no drugs that delay or halt the loss of neurons. Over the last two decades extensive research and drug development efforts have identified potential new drugs for clearing the build-up of amyloid protein in the brain. Unfortunately large clinical trials with these substances have failed, raising new questions about how the disease is represented and understood in the laboratory. Research to date has mainly been carried out on mice with Alzheimer’s-like conditions, known as mouse ‘models’ of the disease. Stem cells may play a role in providing new disease models that enable researchers to study the disease in human cells, and eventually to develop new treatments. No stem cell treatments for AD are yet available. AD affects many different types of neurons in many parts of the brain. This poses a complex problem for repairing the brain. Although research shows that neural stem cells (a type of stem cell found in the brain) can form new neurons, transplanting these into the brain of an Alzheimer’s patient to make new, healthy neurons is not straightforward. Putting new cells into a brain with AD won’t fix why neurons are dying. They might only offer temporary help before more neurons are lost. Even so, treatments using neural stem cells could offer a great deal of help to patients. Even if individuals with AD only get a short delay of the disease, it could have a huge impact on the quality of life of the patient, communities and the economy. For example, a treatment that gives a 5 year delay might reduce both the number of AD cases and economic burden of AD by one third. Despite these significant challenges, scientists have been actively engaged in research on stem cell transplants in mice and studies have shown some benefits. This is still in the early stages of research and there are still many questions to be answered. Much more work is needed before the findings could be applied to developing a therapy for human patients. Another possible approach to stem cell therapies might be to use certain types of stem cells to deliver proteins called neurotrophins to the brain. In the healthy brain, neurotrophins support the growth and survival of neurons, but in Alzheimer’s patients neurotrophin production is low. Neural stem cells produce neurotrophins and so might offer a route to solving this problem. To test this theory, scientists bred mice with the key symptoms and characteristics of Alzheimer’s, such as memory impairment. They then injected neural stem cells into the brains of the mice and observed some improvement in memory. Further studies are now taking place to understand this effect, but the approach has not yet been tested in human patients. Many scientists believe that Alzheimer’s patients will benefit from stem cells in a different way before the development of potential cell transplantation therapies. By using stem cells derived from Alzheimer patients to grow large numbers of brain cells in the lab, scientists can study the disease and search for new drugs. A day in the life of a dementia researcher. Scientist Selina Wray takes Alzheimer’s Research UK through her day. Current research is using a type of stem cell called induced pluripotent stem cells (iPSCs) to study AD. These lab-grown stem cells are made by ‘reprogramming’ other cell types easily taken from patients, such as skin cells. The resulting iPS cells can produce all the different types of cells in the body. This means they could act as a source of cells that are otherwise difficult to obtain, such as the neurons found in the brain. Scientists are using iPSC technology to grow neurons in the lab to study AD. Researchers use iPSC-derived neurons created from the cells of AD patients to study any abnormalities that might promote the progression of Alzheimer’s disease. This includes studying differences in how these neurons produce, move and release the amyloid beta protein, which forms plaques, and tau protein, which forms the tangles in patients’ brains. Neurons derived from iPSCs give scientists a valuable opportunity to study neurons similar to the neurons in the brains of AD patients in the laboratory on a detailed level that would otherwise not be possible. This allows researchers to gain a much better understanding of how and why protein plaques are formed at the very start of the disease and what causes neurons to die. It also lets researchers experiment with new drugs and therapeutic approaches as well as providing a tool to hunt for signposts that can help diagnose AD patients earlier, increasing the chance of success for new treatments. One of the newest advances in neuroscience is the use of iPSCs to grow brain ‘organoids’. Rather than growing neurons on a flat petri dish, brain organoids are grown in conditions that allow neural stem cells to grow into cell clusters in 3 dimensions (3D). These clusters of cells have a greater variety of cell types and create complex cell structures that resemble some aspects of human brain tissue. For example, brain organoids create layers of neurons, just like the layers of neurons in the brain. These layers can’t be formed when cells are grown on flat dishes. The benefit of brain organoids is that they provide brain tissue for studying brain development, function, repair and diseases. Getting living samples of human brain tissue is difficult and can often carry ethical issues. 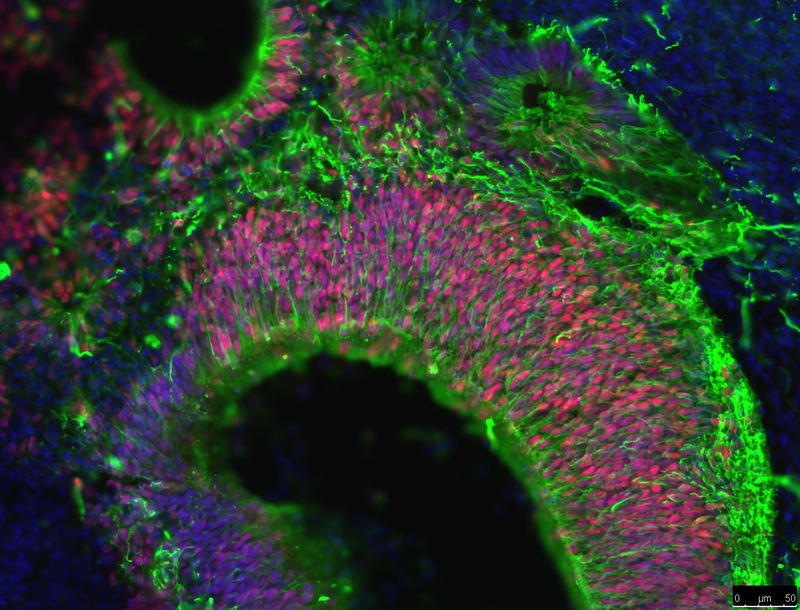 Brain organoids allow researchers to grow brain tissue for experiments. Also, making organoids from iPSCs can allows researchers to study the difference between brain cells with different genetic backgrounds; such as organoids from healthy individuals compared organoids from AD patients. Researchers examine all sorts of ways that cells in these organoids behave, such as how cells migrate, form complex structures and interact with one another. Currently, scientists are attempting to determine if amyloid beta is more likely to form plaques in organoids than flat experimental systems. If so, brain organoids could become an extremely useful tool in AD research, treatment and drug discovery. Micrograph image showing fluorescently labelled cells in a brain organoid. Brain organoids create layers of cells to form complex 3D structures similar to those found in human brains. Another area that researchers are examining is the role of the immune system in AD. Recent studies of the genes of AD patients suggest that a hyperactive immune system could lead to brain inflammation and damage to neurons. Researchers recently have been able to use iPSCs from AD patients to grow microglia, the brain’s immune cells. Researchers want to know how these cells interact with amyloid beta and if these cells might trigger the start of AD in people. Research using iPSCs holds great promise in other ways too. AD is a disease that varies greatly from one person to another. Studying AD using iPSCs from different people has the potential to reveal why there is such variation in AD. It may also indicate what treatments would work best for different individuals and may even be used to develop bespoke treatments, known as ‘personalised medicine’. Although some companies may claim to offer stem cell treatments for AD, many of these are outside the approved and carefully controlled process of clinical trials. There are Phase I and Phase II clinical trials (i.e. trials to assess safety and the effectiveness of a treatment) in the US and other countries around the world. Many of these trials are using mesenchymal stem cells for AD. Caution is advised until the results of these trials are published, as there are serious questions about the scientific rationale and the safety for many studies. It should be noted that websites that list current clinical trials, like clinicaltrials.gov, do NOT evaluate if the trial is scientifically sound or if a reputable institution is carrying it out. Currently, no proven, safe and effective stem cell treatment for this disease is available in the EU or US. However, scientists are already utilizing stem cell technology to carry out rigorous studies on the causes and effects of AD, and expect their findings will play an important role in finding new drugs and perhaps also cell-based therapies in the future. This factsheet was created by Mahendra De Silva in 2014. Reviewed and updated by Fred H. Gage, Laura Phipps, Pietro Tiraboschi, Håkan Toresson and Selina Wray in 2014. Reviewed and updated by Selina Wray in 2016. Edited by Ryan Lewis in 2018. Reviewed and updated by Charlie Arber in 2018. 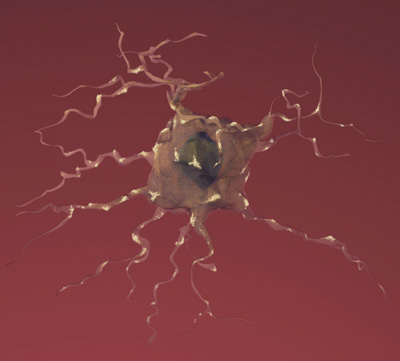 Lead image represents the loss of connection between neurons in the brain with Alzheimers, courtesy of the National Institute on Aging/National Institutes of Health. Animated image created by 7mike5000 from Inside the Brain: Unraveling the Mystery of Alzheimer's Disease by the National Institute on Aging. High magnification image of nerve cells called astrocytes by Nephron. Micrograph image showing fluorescently labelled cells in a brain organoid supplied by Charlie Arber, UCL Institute of Neurology. All remaining images courtesy of the National Institute on Aging/National Institutes of Health. Approximately 35 million people worldwide have Alzheimer’s disease today and well over 100 million people could be affected by 2050. This is a healthy brain (left) compared to a brain affected by Alzheimer's disease (right). Astrocytes are a type of cell found in the brain and spinal cord. This high magnification image shows astrocytes when affected by Alzheimer's disease.